IN early September of 2010, Walter Plywaski lost his home and virtually all his possessions in the Fourmile Canyon fire that devoured the Boulder foothills. But what plunged other fire victims into deep despair rolls easily off this 81-year-old mans proud shoulders. I had an advantage over the other people who lost their houses, Walter tells the Intermountain Jewish News. For him, the theory of relativity also applies to human loss. Walter was born in Lodz, Poland, in 1929. By age 15, he knew the filth of the ghetto, the stench of cattle cars and the nightmare of Auschwitz and Dachau. Today, Walters eyes twinkle with warmth, sweetness, sly humor, even delight. His quick wit hits like a tidal wave, making laughing pawns of everyone in his wake. Walters erudite vocabulary articulates the unspeakable. When circumstances warrant, he invokes the expletive-laden GI English he acquired after the war. Either way, he makes his point. On Sept. 6, Walter was reading The New York Times online in his Sugarloaf residence when he started receiving reverse 911 calls to evacuate. I said, Oh no, I will hold off, I will hold off. I wound up having about 25 minutes to get the hell out of there, Walter sighs. But I had two problems. First, a friend of mine who is 68% Chippewa and the most literate man I know, is deaf. I had to warn him, but he cannot read my lips because he claims I have a Polish accent. So I had to act it all out for him. Then I spent 10 minutes trying to coral my two black cats into the car. No way, he says. The entire structure and its belongings, including photographs of Walters family retrieved during a visit to Lodz in the 1960s, an autobiography in progress and 1,200 books, went up in flames. William Plywaski (born Wlodzimier Fialko), Walters cousin, adopted brother and constant companion in the Holocaust, also lives in Boulder. His Sugarloaf home, located about a mile away from Walter, did not burn down in the Fourmile fire. Walters sense of experiential relativity keeps his perspective in check. WLADYSLAW Plywacki, the only child of Maks and Regina Plywacki, entered the world on Aug. 10, 1929, in Lodz. He lived in the apartment above his parents pharmacy. Walters father was agnostic. His mother was raised Orthodox. After their marriage, religion lessened in significance. The Plywaskis  we were the only Polish family with that name since the 16th century  epitomized the cultural and intellectual diversity that permeated pre-WW II Poland. My father was quite a character, Walter says. As a young man, he was a socialist. He opposed the Tsarist government. His back was scarred with whips and saber cuts inflicted in demonstrations. He also was a Polish patriot and was one of the few Jewish officers in the Polish cavalry. This attitude helped save Walter on numerous occasions in the ghetto and camps. Walter says that his paternal grandmother, whose name hes forgotten, influenced him profoundly. My grandmother lived in a very small Polish village, in a straw-roofed house with no running water. She spoke five languages and taught me to read and write when I was five. His uncle Adam, a bon vivant who attracted the interest of a Hollywood producer because of his resemblance to actor William Powell, introduced his then seven-year-old nephew to café society. Stasia and Lena, Walters paternal aunts, dressed stylishly, smoked cigarettes, haunted Berlins nightclub scene in the 1920s and decorated their apartment with Renaissance artwork. They survived the war. Regina Plywaski perished in the gas chambers of Auschwitz. Maks Plywaski died after being beaten with a shovel at Riederloh, near Bavaria. Uncle Adam hung himself in Warsaw. Aunt Felicja Plywaski Fajertag, who ran an orphanage in the Lodz ghetto, died at Auschwitz. Two hundred members of my extended family were murdered in the Holocaust, Walter says. About 200. It might have only been 180. Only. Now there are only two Plywaskis left on the face of the earth, my adopted brother and myself, he says. Between 35,000-40,000 Jews and Christians lived in Baluty before 1939. That number soard to 130,000 once the ghetto walls closed. Walter insists the ghetto did not frighten him. Because his family spoke only Polish and dispensed with Yiddish, Walter became an unsuspecting recipient of Jewish anger. The Nazis designed the Lodz ghetto as a gradual, systematic killing machine, Walter says. Mordechai Chaim Rumkowski, the infamous Nazi-appointed head of the Judenrat in the Lodz ghetto, was a friend of Walters aunt Felicja. They had worked in Jewish orphanages before the war, Walter says, so Chaim asked Felicja if she would operate an orphanage in the ghetto. Lighter moments interrupted the scent of death. My father knew a wonderful guy in the ghetto, Walter says. His name was Ginsburg, and he was as large as Falstaff. My father paid him a few pieces of bread to tutor us. My brother and I would study the multiplication tables, then suddenly discuss the downfall of Troy. Ginsburg was a scholar. AS the grim years progressed, the Lodz ghetto held more than 200,000 Jews at any given time. 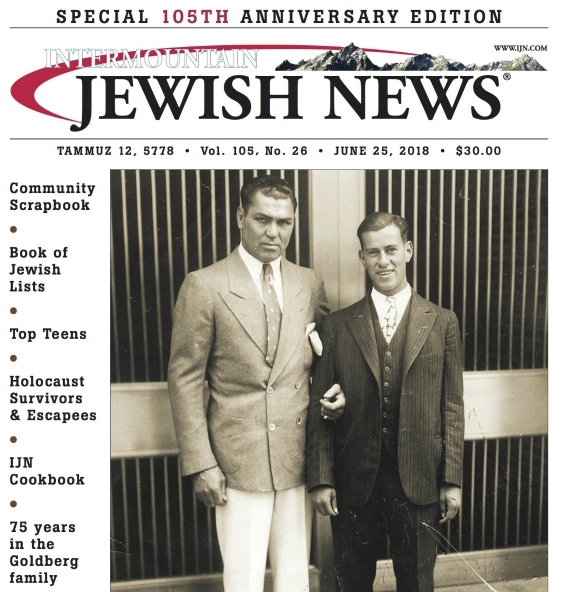 The Nazis deported new arrivals first because they lacked family or connections. Incoming Jews from all over Europe took their place  for a few days or weeks or months. By the spring of 1944, the ghetto was down to 30,000 Jews, Walter says. That figure included my parents, my brother and myself. Walter and his father knew the truth. There was no resettlement, only death. My father taught me how to die about a year-and-a-half before we were sent to Auschwitz, he says. I didnt realize how much it cost my father to say this to me until I had children of my own. Unexpected tears glisten in Walters eyes. In June, July and August of 1944, the Plywaskis hid in an attic at the edge of the ghetto. We took out the insulation and hid between the beams, Walter explains. It must have been 125 degrees Fahrenheit. You dont dare sneeze. You dont cook. We left garbage on the stairs so the Nazis would think the place was abandoned. The Plywaskis were among the last Jews to leave the Lodz ghetto. The family was deported to Auschwitz that August. The family arrived at Auschwitz-Birkenau on Walters birthday, Aug. 10, 1944. He was 15. The survival rate at the camp was approximately two weeks. Fifteen was the borderline between extermination and being allowed to live, Walter says. If you were under 15, the Germans didnt let you live. The extra food and treatment we got through Rumkowski in the Lodz ghetto worked to our advantage. We still had fat and muscle on us. Walter, his father and brother were ordered to stand in one line. His mother was ordered to the other. That first day, Regina Plywaski met her fate in the gas chambers. Walter and William spent a week in quarantine before being released into the mens camp, where their father waited beyond hope. Then my brother and I lied our way into Josef Mengeles barracks, Walter smiles. No, we were not twins, he concedes, but we heard there was extra food there. A few days later, the Kapo smuggled the brothers out of Mengeles torture chamber. This was the first time a non-Jewish Pole saved Walter. It would not be the last. His voice breaks. He picks up the same napkin. Taking a sip of strong caffeinated tea, Walter resumes his story. WALTER watched out for his brother at Auschwitz, the labor camps that followed, and Dachau. Relying on his innate intelligence and his fathers advice  Dont follow a crowd because they are probably doing something wrong; always look for opportunities to survive  he repeatedly rescued William from transports and selections. Walter relates a vivid memory at Auschwitz almost poetically. One day I see this beautiful man, like a Renaissance angel: elegant, wearing suede gloves, carrying a walking stick in his hand to hook you around the neck. I think he picked up on my incipient violence. Walters lips form an impish semi-circle. Im an atheist, Walter announces. Once in Auschwitz, we were on lock-down in the barracks. And we hear high-pitched screams coming from somewhere outside. The Kapo comes in and tells us that the Nazis are burning children seven and under alive. Walter, his father and brother were sent to Landsberg-Kaufering 4 concentration camp in mid-September, 1944. They had been in Auschwitz less than two months  an eternity. LANDSBERG, Kaufering and Riederloh (They called Riederloh a punishment camp, if you can believe it) operated within Dachaus nefarious network of camps scattered throughout Germany. At Landsberg-Kaufering 4, Walter labored in the potato fields and constructed concrete buildings for the Nazis. The barracks were rectangular holes in the earth with earth bunks and a roof at ground level, he says. After Landsberg, the Plywaskis worked for two weeks at Kaufering-11 concentration camp. All the laborers who toiled on the landing strip were deported to Riederloh. For Maks Plywaski, this would be the end. Have you heard the Yiddish term Muselmann? Walter asks. In the camps, when people were starving to death, it affected their brains. You become like an automaton, resigned to your fate. The old prisoners called these people Muselmann. You are resigned. You behave almost catatonically. Despite his deteriorated condition, Maks Plywaski mustered his fury and insulted a camp commandant. I think he did this because he knew I was watching, Walter says. He verbally attacked that commandant because there was no hope. He was illustrating the lesson he taught me, for the last time. This commandant was so astounded by my fathers behavior that he stood there for maybe a minute, listening. He could not move, like Lots wife. Walter was a runner in Riederloh, carrying messages between the camp guards and SS officers. The German officer stopped  but it was too late. Two days later, Maks died in the Muselmann barracks. He was 51. WALTER and William were deported to Dachau I in January of 1945. Ugly holes had formed in Walters legs from prolonged malnutrition. Once again, two Polish Kapos stepped in to save his life. The holes in his legs began healing in two or three days. The Kapos put a corpse in Walters bed and smuggled him out. Then I rejoined my brother in the quarantine barracks, he says. The fortuitous move turned out to be another death trap. All of us in the quarantine barracks were scheduled for extermination, Walter says. Aided by the Kapos, the brothers names were added to a list of inmates who were shipped out of the camp prior to the barracks annihilation. Walter twice tried to escape the camps. He made his first attempt  with William, of course  at Turkheim in March, 1945. The death march to Karlsfeld, a Dachau subcamp located about 12 miles north of Munich, began at the end of March. It was very brutal, Walter says. We were underfed. There was little water. I dont know how many Jews were murdered in the Nazis random shooting games. Somehow, the Plywaski brothers made it. BY April of 1945, repeated aerial assaults from Allied planes were taking their toll on the Nazi infrastructure and psyche. During one bombardment, Dachau 2s electrified barbed wire shorted out. Nazis hid in bunkers to avoid the inevitable. The pair crawled ran through a potato field. There was shooting all around us, he says, but we finally made it to an abandoned German anti-aircraft hanger. His expression falls into a dream. The Nazis left an iron pot on the stove. It was still bubbling with corned beef stew, peeled onions, potatoes, mushrooms and carrots. The memory breaks his heart with gratitude. A few tears fall. Walter wipes them away. A while later, they were overcome by strange-looking soldiers who had been crouching in a ditch. Walter refused to speak any German, fearing he would be mistaken for an escaping Nazi. From May of 1945 to May of 1947, Walter accompanied the GIs to various units in Strasbourg, Aix- en-Provence and Marseille. He arrived at Ellis Island on Dec. 16, 1947. Walter worked as a printer in Philadelphia, where he stayed for one year, and served in the US Air Force from 1948-1952. He then enrolled at Oregon State University in Corvallis, Oregon, with every intention of majoring in English literature. His professor, the renowned author Bernard Malamud, dissuaded him. So I switched to electrical engineering. It was an excellent choice. He met his wife at Oregon State. They divorced 30 years ago. In 1962, Walter moved to Boulder to join the National Atmospheric and Oceanic Administration. He relocated to the foothills in 1965. Despite his negation of religion, its an identity Walter holds close. I am a Jew  especially when I meet anti-Semites, he says. Walter, who has had threatening run-ins with the KKK, hurls vicious insults that send them running in the opposite direction. Holocaust survivors attribute their survival to a wide range of factors. For me, it was luck, Walter says. About 80% luck, 10-15% the education my father gave me (including German lessons), and 5% intelligence. I also had the knowledge that I could dictate how I would die. It gave me this chamber of freedom in my mind, which meant that I didnt panic like other people. Walter tugs at his collar, as if catching his reflection in an invisible mirror. Asked to consider what kind of man hed be today if he had never experienced the Holocaust, Walter hesitates. Of course, I prefer it never would have happened, he says. I didnt volunteer for it. No one did. But I have no idea, no idea, who Id be without it. I love my life, very much, Walter says. I suspect it means more to me because of what Ive been through  because after the camps, I never had a single bad moment in my life. No matter how dire a situation looks, an instinctive comparative function kicks in.